A Blanket Of Clouds On The Move. Sometimes I wonder why the weather is so valued as a metaphor. Look at the sky and you see blueish to dark greyish colours with your limited sight. Look into the sun and rays of light can blind you. The moment a cloud moves over a shadow is cast over you and expect at least a shadow. Humans cannot control the weather, only influence its cycle. Even so human civilisation, humanity has adapted generation after generation to the changing seasons and weather conditions. There have been many changes and shifts. Our perception of time is based on measures of sunlight in day time. Additionally measures of the moon and stars led to calendars and navigation. Whenever clouds entered the sky they could bring either much desired rains or much dreaded storms. When entering a state of introspection I questioned my thoughts. Behind the each thought is an accumulation of impulses and emotions regarding a specific situation. To quote Emerson Lake & Palmer I first “Take A Pebble” and balance on a “Knife-Edge” before deciding. Then “The Three Fates” await me in the form of “yes”, “no” and “I do not know.” If my mind was a sky it would be clouded by thoughts. In the end the sky goes through phases of absent clouds and present clouds. What the clouds bring depends per season, climate and day. Today the 8th of July the clouds brought a shade, some rain and coolness to heated earth, bricks and skin. 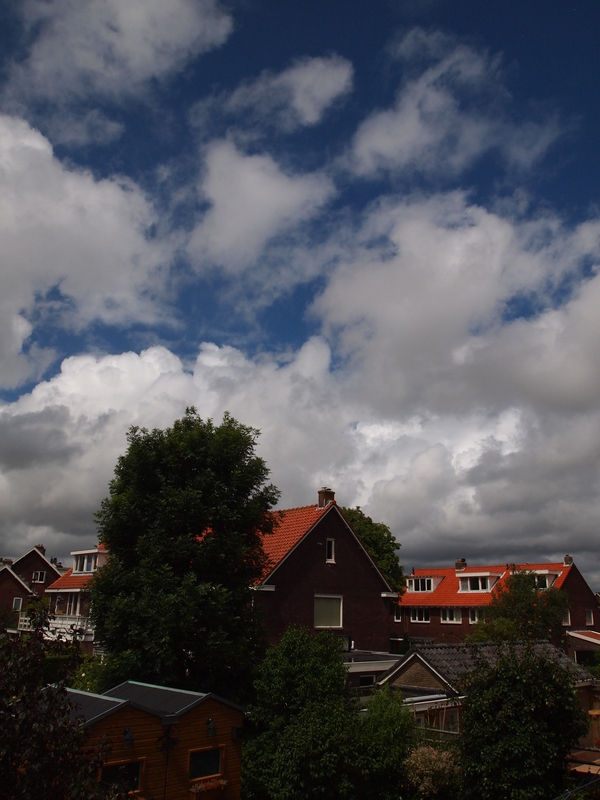 The weather in the Amsterdam region is generally moderate and there is always a soft breeze. After a sunny period these clouds were quite welcome. When I looked through the window I knew something was certain. I took my camera and quickly made some pictures. I had one thing on my mind. Get the exposure right to catch the sublime layers. Aperture F16, adjust the shutter speed and check the focus point in the composition. A good picture was the result. There were clouds in the sky. Posted in Short Reads and tagged 08-07-2015, changes, clouds, coolness, ELP, exposure, haiku, moon, perception of time, picture, rains, seasons, shadow, shifts, sky, storms, sun, thoughts, weather on July 9, 2015 by rura88.